I am very excited about this giveaway today. This is for a book that I have been working on with my friend Raegan for years (Raegan is the one who wrote the Chronic 45 Minute Naps post on this blog). Seriously years. I had no appreciation for how long it takes to create a book until we dove into this book. 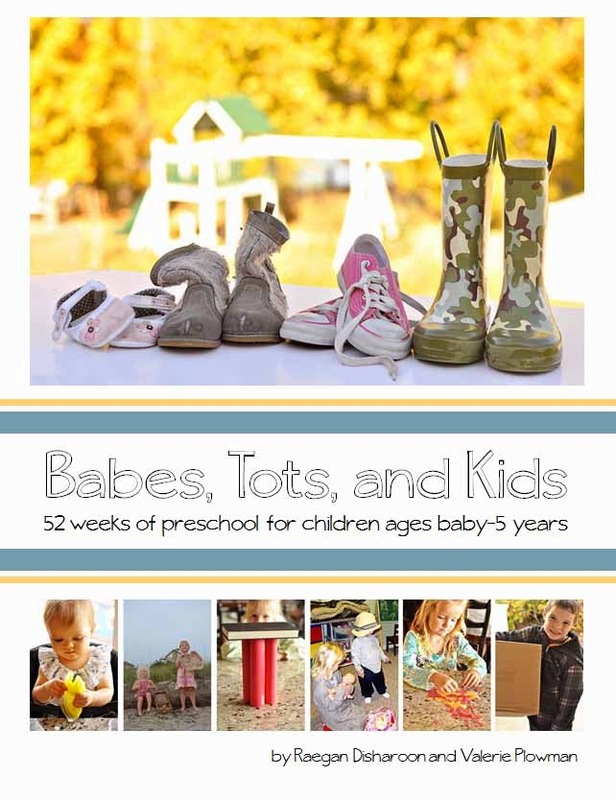 Babes, Tots, and Kids is a book that is 52 weeks of preschool all planned out for you. You can visit our website at www.babestotsandkids.com. We wrote this book with multiple ages in mind. We talk about how to adjust activities to work for multiple ages. This way, you can do the same activity with your 12 month old as your 5 year old. There are already several “learning activity” books out there, and they are excellent. What sets this book apart from those? This book does the organization for moms already. This book ensures the basic skills are fully covered over the course of a year—and even from week to week. This book provides not only the ideas to do, but lumps them into fun themed weeks and provides the activities to do each day of the week. It is a great book. And you can jump in any week of the year. You can get it now and start in Januray (or next week) or you can get it now and start next September. Whatever works for you. You can read more about the book here. If you would like to order a book, go to www.babestotsandkids.com. We are launching today and in celebration, are giving away a copy! Entries will be accepted until 12:00 midnight December 12, 2014. This is exactly what I have been looking for. I want to start preschool for my 3 year old in January, but I have been feeling overwhelmed with the idea of lesson plans. I think this book will help me know what to teach him and help me be consistent. For sure! I have (obviously) used it myself and I love it. I would love to use this book with my kids. It sounds wonderful! I'd love something like this to use this next year with my three-year-old! Congrats on writing a book, Val!